Made of a new, hypo-allergenic material, soft and very durable, these disposable fitted sheets are perfect for hotels, motels, hostels, inns, B&Bs, day care centres and unexpected visits. 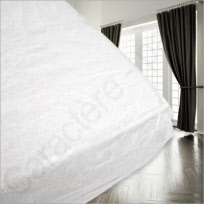 Effective prevention against the spread of lice, bedbugs, bacteria and dust mites in mattresses, they come individually packaged and after use can be thrown away or recycled. Our non-waterproof fitted sheet can be used for one to two weeks. Its elasticated edges and corners keep it from slipping off the mattress while the bed is in use, and the cool, breathable fabric helps prevent sweatiness. Here is the UK bed sizes reference from Wikipedia.